Our first introduction to creation space was a camp that our six year old experinced where they created and decorated a dollhouse, right down to the characters and the furniture. An empowering camp for the kids to create from items I would have never thought to use, or offer, we were immediately enamoured with the thought and incredbile ideas Alie has, and how these translate into experiences for children. Bright, open and full of wonderful treasures that have been created by children and adults alike, Creation Space won over my heart with the brightness, warmth and lovely environment the first time I entered the studio. You can’t help but leave inspired! Open studio at Creation Space is nothing short of magic – and we had the chance to discover that because for the last few months of the year our childcare situation adjusted from Tuesday and Thursday to three days a week. What ages is the open studio for? Age 16 months and up, please not all materials in use will be non toxic, however there are always small parts and pieces in the studio and we ask that parents supervise children under the age of 3. Children that are over 4 years and potty trained may be dropped off but we also love having parents and siblings under 16 months stay and join in free of charge. There are multiple rotation sessions set up through the room where kids can create, craft and take part in different sensory activites and for two hours every Thursday morning there’s this wonderful space for them to explore at their leisure. 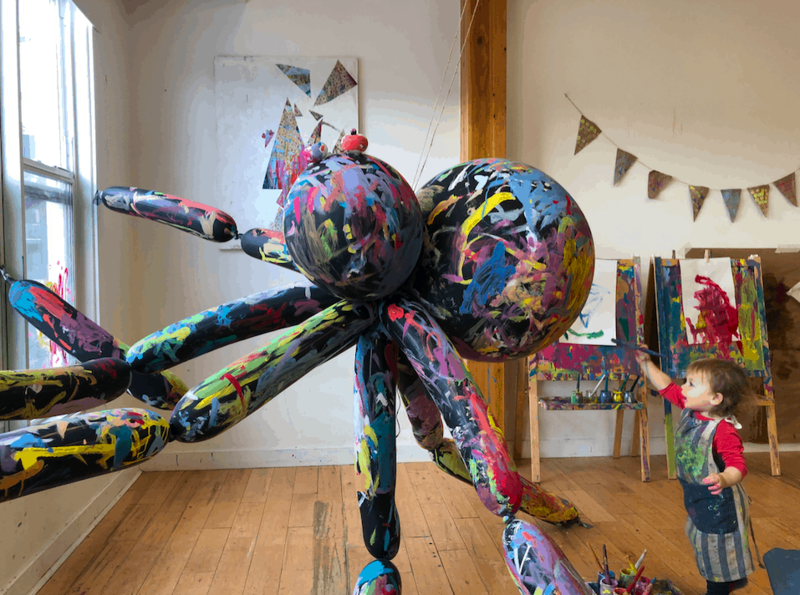 Our first experience left Stella apprehensive – I mean, she could paint on the spider, fabric on the wall and even get a few strokes of the paintbrush on the easel? There’s magic in the unstructured, open-ended art play that we try to create at home (but let’s face it – if you’re anything like me, you’re hovering when there is paint, or small pieces from a sensory bin that you know are going to end up all over the entire house. The magic for the parents to be able to observe and take part in this play (or let the kids play independently) without having to worry about whether they’re going to get paint on the walls at home. Open studio is welcoming, bright and relaxed. Alie is warm, and engaging with every child that enters the space, and it’s an experience that you should experience at least once. Be warned though, once you experience the open studio at Creation Space, you’re going to want to go back again and again. Creation Space open studio is priced at $9/half hour, and you can stay for as little or as long as you would like through the two-hour session. The first time, we stayed for an hour. It flew by, as Stella moved from activity to activity. Visit Creation Space at www.creationspace.ca to book the next open studio (it’s popular – register – but there is drop-in available if spots allow) and learn more about the workshops and camps for kids in Edmonton.